A day late because I spent last night raising money for Puget Sound Blood Center. It was a blast! I love soccer, and I’ve been looking forward to this World Cup since, well, since it ended in 2010. Back then I watched games at pubs in England and Germany between revisions to my thesis; this year I’ll do more listening via a streaming app since now I have a desk job. Like many people, I spent my youth loving the Olympics (and later, the World Cup) without really thinking about the impact the games have on the cities and countries that seek to host them. The past few years, however, especially in the lead up to the seemingly extraordinarily corrupt Sochi games, have brought the issues of these large-scale sporting events to my mind. I mean, I’d heard about bribery in Salt Lake City, and I know that, on a smaller scale, new stadiums are often sold as an economic boon to a city but rarely if ever actually make up for the economic and social costs. When I saw that Dave Zirin, sports writer for The Nation, was writing a book about the lead-up to the World Cup and the Olympics in Brazil, I knew I had to check it out to try to educate myself. This is a good book. It’s written in a way that kept me engaged, and I think part of that comes from Mr. Zirin’s talent as a magazine writer. While he’s written other books, I primarily associate him with shorter pieces, and this book feels like an extension of a short piece (in a good way). He condensed a lot of complicated history into a few pages, which obviously can’t tell the full story, but it gave enough background to set the current stage. He shared interviews with the residents at risk of being evicted by World Cup and Olympics construction, and helped shatter (for me anyway) the idea that favelas are primarily dangerous ‘slums’. He doesn’t gloss over the real problems that already existed in some of these areas, but he also shares why these communities feel so connected to their homes, and why what the government is looking to do to them is so troubling. I’ve known for a while that my education in this area is woefully lacking; I’m more than a little embarrassed that it took the World Cup coming to Brazil for me to seek out more information on it. I did want more from this book, but it’s hard for me to put my finger on what that is. I’m so glad he wrote it, and I hope more people read it. I also hope that he does a follow-up book on what happened during the World Cup, what else is happening with the Olympics, and perhaps offers up some suggestions on how we can throw these giant events without them turning into corrupt endeavors that serve to make the rich richer. The World Cup started today. 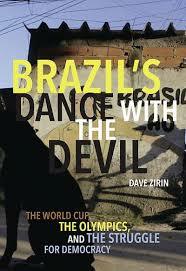 I’m currently reading Dave Zirin’s “Brazil’s Dance with the Devil,” which is about the lead up to the World Cup and Olympics. It’s fascinating and disturbing. Neil deGrasse Tyson is national treasure. Hopefully you all are aware of this, either because you’ve known for years, or because you caught the fantastic Cosmos this year. About three years ago I was lucky enough to see him speak at the local university, where he told vivid stories that helped me understand the scale of things in the universe and on earth, including one story that aided me in fully grasping how much money Bill Gates really has. Mr. Tyson is coming back to Seattle this fall and the shows are already sold out, which makes me so, so sad. But at least I have his books, and honestly that’s saying a lot, because the books are awesome. “The Pluto Files” tells the story of Pluto and the drama surrounding its reclassification. Now, I love science, but my last formal education in the field was over 15 years ago. Sometimes I fear I won’t be able to follow science books, but Mr. Tyson has this lovely way of explaining things that makes them understandable but somehow doesn’t make me feel like he’s talking down to me. He’s clearly a brilliant scientist, but I think he’s brilliant writer as well. The book provides a history of Pluto’s discovery, and is full of fun facts, like why moons of planets usually follow the convention of characters from the myths of the gods the planets were named for, but one’s moons are named for characters from Shakespeare. I love these trivia nuggets (I find they come in handy during pub quizzes), and they are dropped throughout in a manner that keeps what could have been dry material interesting and even light. Part of the story around the reclassification ties in with the opening of the Hayden Planetarium in NYC, and Mr. Tyson describes in some detail all the thought that was put into building this lovely facility. Understanding the nature of science and the fact that some things change, he shares how they addressed the more concrete versus the more likely to change elements of the exhibit. It’s an interesting story because the planetarium staff had to make a call on how to address Pluto while the discussion about classification was going on. 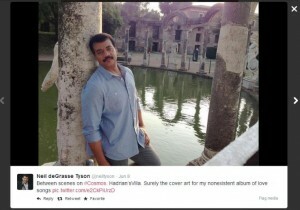 Because of Mr. Tyson’s opinion on the topic, as well as his association with the Hayden Planetarium, he has been subjected to many letters – often with an angry tone, and often from whole classes of children – decrying the decision to remove Pluto from the list of planets, and he shares them with us. He clearly has a sense of humor about all of it while avoiding being condescending to people who don’t have the level of knowledge he has. If you like science, pick this book up. Shoot, if you just like a good story, pick it up. It’s a pretty quick read, and it’s highly entertaining. Another day, another mass shooting. This time in Seattle.